How do I use Eziwash? 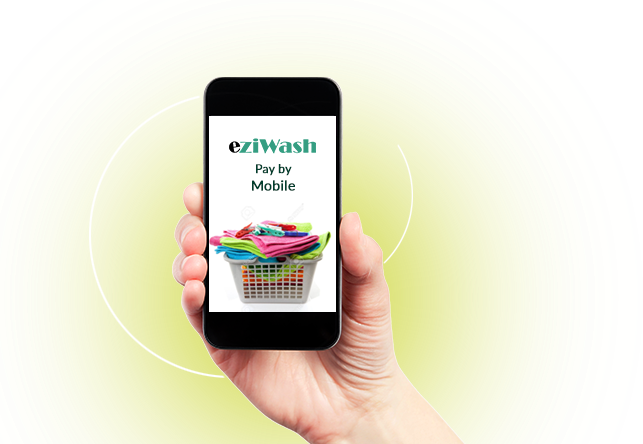 Register by visiting the Eziwash login page for your laundry location. Click 'register' and complete the registration details. You will be automatically logged in once you complete registration. If you have previously registered, login to your account via the laundry login URL or scan the QR code on your choice of machine. View your balance on the Welcome screen. If you need to add credit to your existing balance, go to the next step. If you have enough credit, go to Choose Machine. Select the Menu. Choose the amount you wish to top up your account. The most popular top up is 'Fast Top Up $20' - this will credit $20 to you account. Other top up amounts are available. On the black payment screen, your payment amount will be automatically displayed. Enter you credit card details including card type, card number, expiry, CCV and card name. Select Next. Your account will be credited with your top up amount. Each machine has an Eziwash sticker that displays the unique machine number and service code. From the Menu, choose your machine by selecting the correct machine number. Alternately, Search and Find Your Machine. Information about your selected machine is displayed. Check your machine number is correct. Now enter the service code - also printed on the Eziwash sticker on the front of the machine. Check that the price is correct. Proceed by pressing the 'Charge Now' button. Washers will count down on the LED coin display until $0; Dryers will flash "ready". Select your preferred temperature on the machine, then press the Start button. Your machine will start. 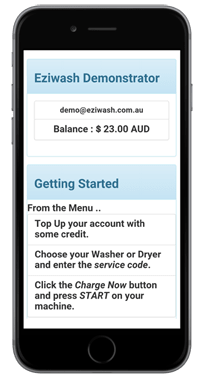 Eziwash is an Australian based technology provider to the Laundry services industry, backed with over 25 years industry experience. 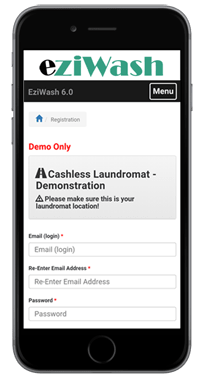 Now with over 10,000 customers and 50 sites, Eziwash is a comprehensive laundry management system designed to accept customer payments for activation of washers & dryers. The cloud software solution is devised to be used with smart phones, tablets and laptops. All credit card payments are PCI compliant. What brand of machines does Eziwash support? Eziwash is available on all major laundry brands, including Dexter Laundry, Speed Queen, Maytag, LG, IPSO and Primus. Installation is low impact and completely hassle free. Currently, Eziwash accepts Visa and Mastercard (Debit & Credit), Diners & American Express. Can my laundry machines still accept coin? Absolutely! 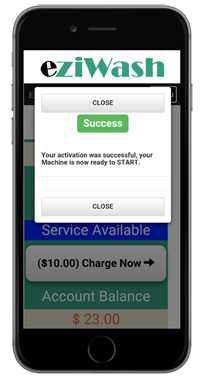 Eziwash works in conjuction with your existing coin mechanisms, so you can accept coin or cashless payments from customers. 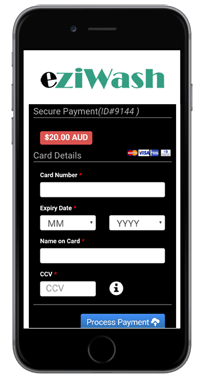 All payments are processed by one of one of Australia's largest non-bank electronic payment processors, Ezidebit. Ezidebit is Level 1 Payment Card Industry (PCI) compliant and is a participating member of the PCI Security. Ezidebit is licenced by the Australian Securities and Investment Commission (ASIC) as an Australian Financial Services Licensee (no. 315388). All details are encrypted and stored using Ezidebit's secure card vault. 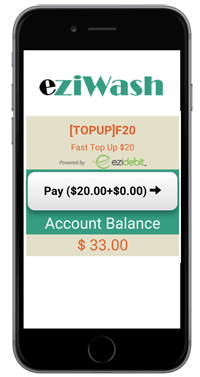 At no time does Eziwash have access to your payment details or take a payment without your permission. 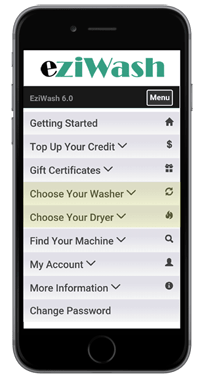 What type of laundries suit using Eziwash as a payment type? 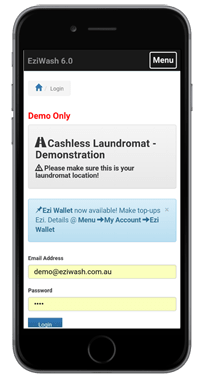 Cashless payments are very popular in all types of laundry setups, including self service laundromats, laundries within university & residential colleges, caravan and holiday parks, holiday accomodation, student accomodation and backpackers. 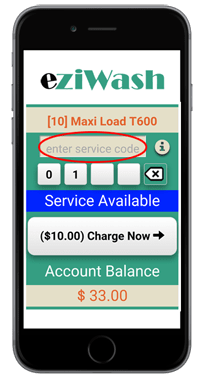 The Laundry Payment Solution for the Business Savvy Owner.